2018 has already been a monster year for movies. Black Panther, Avengers: Infinity War and Deadpool 2 pushed superhero movies in new and exciting directions (and made a ton of money in the process); A Quiet Place was a masterclass in tension; Spielberg went self-referential in the pop culture explosion that was Ready Player One; while Star Wars had their first 'flop' with Solo (though can you really call a film that's made $370 million, and counting, worldwide a flop?). And there's plenty more where that came from. There's superheroes (animated and live action), ABBA, giant sharks, naughty puppets and the return of a certain famous nanny as we look forward to the best film still to be released in 2018. The Towering Inferno meets Die Hard as the 'tallest, safest building in the world' inevitably becomes a disaster zone and war vet Will Sawyer (Johnson) punches, leaps and swings into action to save his family. We've waited 14 years for Pixar's superhero sequel. Elastigirl finds herself on a new mission to stop evil villain Screenslaver, while Mr Incredible stays at home to look after the kids. ABBA tunes a-go-go as we head back to Greece and find out more about Donna's (Streep, and James in flashback) past. Big bonus points for casting Cher as her mum! Another fast paced mission to save the world. The stunts look insane with Cruise breaking his ankle on set and one of the most dangerous and exhilarating helicopter chase sequences ever captured on camera. At last a female hero gets a title credit in the MCU. Shrinking, growing and other size-mic shenanigans in Marvel's funniest superhero franchise. A human and a puppet have to team up to solve a series of grisly murders. A super sweary, crude and rude take on the Muppets directed by Jim Henson's son. Amazingly Spike Lee's latest film is based on a true story about a black police officer who went undercover in the Ku Klux Klan. The alien hunter is back taking on a team of rangers and a huge 'ultimate' predator. Directed by Shane Black who starred in the original 1987 sci-fi action flick. The Spider-Man villain gets his own movie. A dark and violent anti-hero as Eddie Brock (Hardy) becomes bonded with an alien lifeform. Masked serial killer Michael Myers is back on another murderous rampage in this slasher reboot that ignores all the previous sequels. The big news for horror fans is the return of Jamie Lee Curtis and John Carpenter (as exec producer). The story of rock gods Queen in this Freddie Mercury biopic. 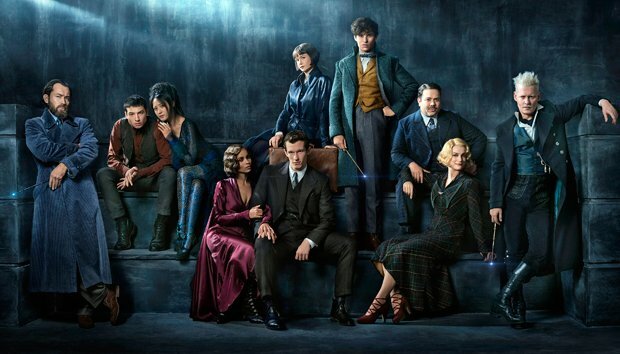 The second Harry Potter prequel written by JK Rowling introduces Jude Law as a young Dumbledore as magical zoologist Newt Scamander (Redmayne) helps track down evil wizard Gellert Grindelwald (Johnny Depp). Rocky, the ultimate boxing franchise, continues this time around Adonis Creed (son of Apollo Creed) goes head to head with Viktor Drago (the son of Ivan Drago, played by Florian Munteanu). Ralph (Reilly) and Vanellope (Silverman) head out of the arcade via the magic of wi-fi for more super cute computerised adventures. Mowgli returns to the jungle in this live action / CGI epic based on Rudyard Kipling's Jungle Book. Release date: 19 Oct 7 Dec on Netflix. DC haven't had much luck when it comes to movies the last few years. They've made a lot of money but not many fans (Wonder Woman aside) hopefully they can turn things around with underwater superhero Aquaman (played by man mountain Momoa). Predator cities roam the countryside consuming smaller towns for resources. Based on Philip Reeves much loved YA novels. everyone's favourite singing nanny after 54 years with Blunt taking on the iconic title role.